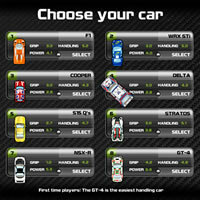 Drift Racing: Rebrandable Flash Driving Games by Galaxy Graphics. 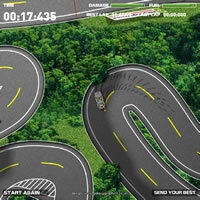 Drift Racing Stage 1, 2 and 3 : Flash Driving Games. This series of three driving games reflect two popular motorsports: drift racing and rallying. Using the cursor keys, the player can control the car and slide it around a series of courses : Road, Snow and Desert. Each track has its own database- driven score table of fast lap times, encouraging previous winners to return to see if their score was bettered. The game is built upon a sophisticated driving game engine suitable for any type of game that involves moving a player around an environment collecting items. Galaxy Graphics also have another driving game built upon this engine, F-Sprint, a Formula 1 game with multiple cars on- track at the same time. Looking for this driving game source code in actionscript? This is also available to buy from Galaxy Graphics. Click here to contact us about driving game source code.